Unbeatable convenience from the nearby subway and Toronto’s 400-series highways puts the entire city on the doorstep. A wealth of desirable amenities to complement an upscale, uptown lifestyle, from gourmet shops and fine dining to charming boutiques and Bayview Village Shopping Centre make even errand-running a pleasure. Green spaces beckon walkers, joggers, dog-fanciers and cyclists. In the gorgeously green spirit of its Bayview & Sheppard neighbourhood, residents at Park Towns will enjoy beautiful parkland surroundings and lush on-site landscaping. An enclave of sophistication that starts with crisp, brownstone-inspired architecture by SMV Architects, Park Towns’ green environment belies its proximity to the best aspects of urban living. The Bessarion stop on the Sheppard subway is right next door and Bayview Village Shopping Centre barely further afield, with a wealth of shops and services that cater to busy lives. Gourmet market Pusateri’s has everything for a night in with friends, while Oliver & Bonacini Café Grill offers delicious dining. Venerated retailers such as Brooks Brothers, charming new designers such as Project Runway Canada alum Brian Bailey, and must-shop fashion picks such as Mendocino and Roots make window shopping almost as much fun as buying. Active Park Towns residents will appreciate the on-site Mountain Equipment Co-op to help outfit them for all their adventures, whether it’s new cross-trainers for a city trek or a yoga mat to help stay grounded – and they’ve got the yoga classes to go with it. Bryon Patton & Associates, one of Toronto’s best-known and highly regarded interior design studios, has created intelligent one, two and three bedroom interior layouts, offering a rare opportunity to combine condo convenience with the privacy, outdoor access, and valuable investment that distinguish the finest townhomes. 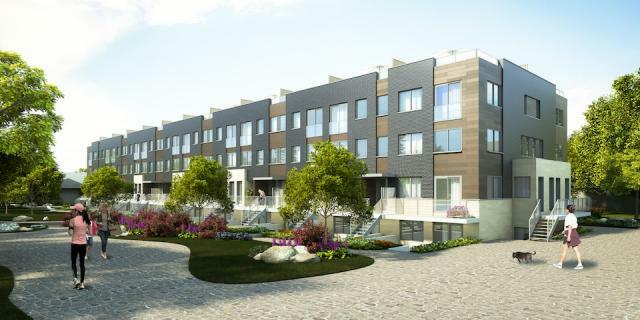 Prices start in the mid-$200s for one bedrooms and from $399,900 for two bedrooms plus den. Park Towns present meticulously chosen features and refined finishes such as 9 ft ceilings, modern kitchens with a choice of ceramic or tile kitchen backsplash, full size stainless steel appliances and granite or caesarstone countertops. All units will include a balcony, a terrace or an outdoor courtyard with a gas hook-up. With more than six decades building a reputation for excellence in residential, retail and commercial arenas throughout Ontario and Quebec, the third-generation Broccolini (broccolini.com) family has in recent years applied its scrupulous quality and character to some of the country’s finest residential developments, including 155 Redpath in Toronto, the Slater in Ottawa and Montreal’s striking L’Avenue. Company values still harken to that time, when a handshake was as good as a legal contract, and building relationships meant even more than building great projects. Developer: Broccolini, Park Towns Developments Inc. Sales: Baker Real Estate Inc.